This fish is also called as God of China , it has been belived by Chinese that this fish brings prosperity to his owner and his family , bad energy is destroyed by this fish . The Red Tail Arowana is original as it has certificate and micro chip inside fish body to identity For complete guidance contact us . Happy Fisssshing. The Arowana is a long, sleek streamlined fish of great beauty with a unique character. Arowana are large and often aggressive with the potential of rapid growth. Many believe that Arowanas bring good luck and fortune. Minimum order is 20 pcs, below that please contact us for negotiation. Export size is 10 - 30 cm. Size: 5 to 36 Inch. 8 to 25 inches green arowanas now available in stock. Our prices are very moderate and we ship worldwide. We provide to our client best quality arowana fish. 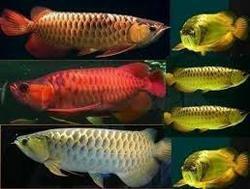 We have good quality baby arowanas very cheap price. We have gained a remarkable position in the market that is involved in offering Arowana Fish. - Origin: Asia and Oceania. - Diet: Floating Pellet food, Shrimp etc.